I would like to thank Egmont Publishing for providing me with an advanced reading copy of this book. 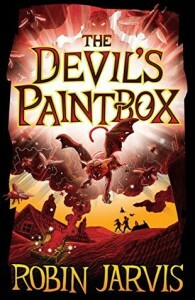 The Devil's Paintbox is the second book in The Witching Legacy trilogy by Robin Jarvis. I previously read the first book The Power of the Dark back in March 2016, you can find my review for that here. I really enjoyed the first book in the series, but I have to say, I enjoyed the second book much more than the first. It's been a year since I read the first book and I was surprised by how easily I slipped back into Lil and Verne's world. The writing was wonderfully vivid. The plot was engaging, fast-paced and action packed from beginning to end. It sets the imagination on fire and I could easily see everything clearly in my mind's eye as I read. The Devil's Paintbox is full of colour, adventure, magic, and imagination, but at the same time it's dark, ominous, and creates a feeling of foreboding. This is the kind of book I would have loved to have read as a child, under the covers with a torch. I could almost feel the excitement and anticipation that young me would have felt, along with the need to turn the pages whilst being apprehensive about what's to come. Definitely one I would recommend. I didn't want to put the book down, it was a lot of fun and I read it in one sitting. My niece and the kids in my reading group are going to love it.